If you have read my blog for a while, you know my dad is a retired structural engineer. He's been sucked into many a project at my house. He has also listened to me over the years talk about how I would like to replace my existing garage. My garage is original to the house.While benign neglect worked for me in the case of my house, the garage did not fare as well. The interior concrete is entirely broken up and at some point someone hit one of the load bearing supports near the door. So, the entire structure has a bit of a lean to it. It is also quite small. So, small in fact that I don't park in it. Ever. It houses a lawn mower, a fertilizer spreader, a bunch of garden tools, shovels, lawn furniture and a motorcycle. That's about it. 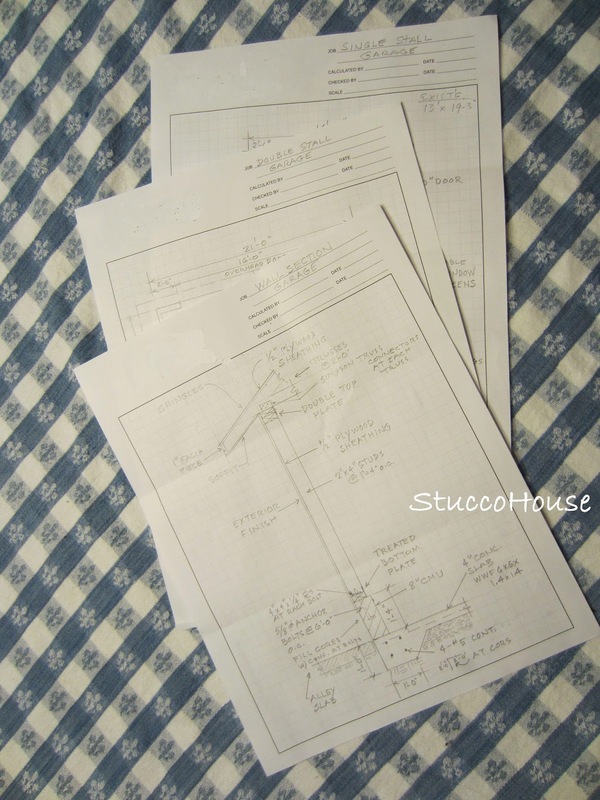 So one day a couple of months ago, my dad surprised me with structural drawings for a new garage. He drew up specs for both a generous single stall and a generous double stall garage. The exterior can be either wood clapboard or stucco. All my choice. Both drawings include a little built-in gardening bench in the back. Cute. I now have the drawings. So when I get around to actually getting serious about the garage, I have a trusted design to use to get bids.